Daisy Farm Crafts is sponsored by Yarnspirations.com. Yarn mentioned in this post has been provided by them. 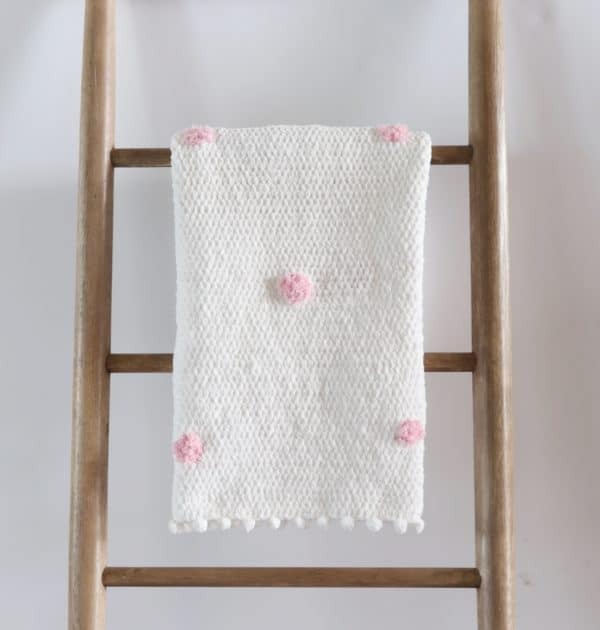 I continue to be totally in love with using Bernat Blanket Tiny yarn for my baby blankets. I love how soft and squishy it is. I’ve also been wanting to figure out a way to use Pipsqueak Yarn, that wouldn’t involve too much actual crocheting, because it really is a tough one to see the stitches made. And I love how the border turned out! It’s a very simple version of my polka dot border where I just am using a DC5TOG cluster stitch separated by slip stitches. Here’s a written out version of the DC5TOG stitch: Yarn Over (YO) insert your hook into the designated space, YO and pull back through. YO and pull through 2 loops on hook. *YO, insert your hook again into the same designated space, YO and pull back through. YO and pull through 2 loops on hook. Repeat the instructions from the * 3 more times. Then, YO and pull through all loops on your hook, there should be 6. ROW 1: In the third chain from the hook, work a half double crochet (HDC). Work one HDC into each of the chain spaces across the row. Chain (CH) two and turn. ROW 2: In the first space just to the left of the first post, work one HDC. Work one HDC into each of the spaces across the row with your last HDC being worked in between the last post and the chain 2. CH 2 and turn. 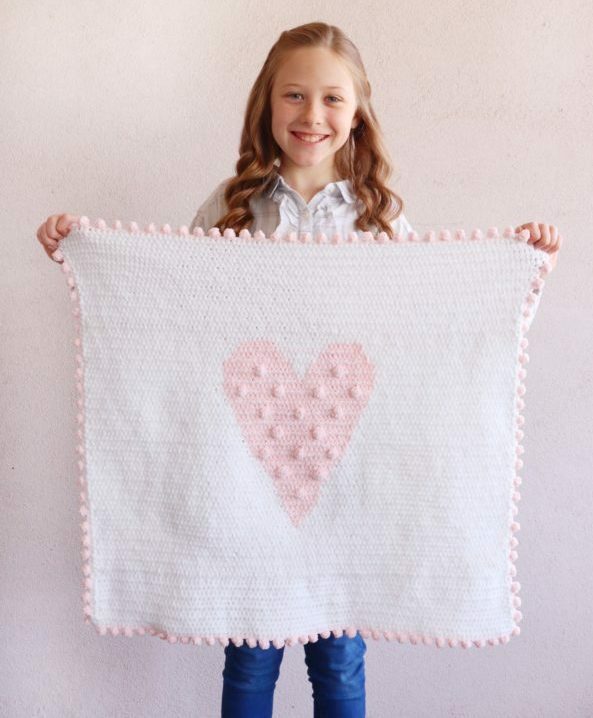 Add remaining rows until your blanket is square by repeating Row 2. After finishing your last row of the blanket, chain 2 and turn the blanket to work down a side. HDC one stitch per one row. Work 3 HDC into the corner space. Continue working with HDC in between the posts across the bottom. Work 3 HDC into the corner space. Work up the side in the same manner as before crocheting 3 HDC into the corner space. Work HDC’s across the top. Finish with 3 HDC in the corner and join with a slip stitch to starting chain 2. CH 2 and work in the same direction around the blanket 4 more times for a total of 5 rounds of border. Pom Pom Round: Continuing on in the same direction, slip stitch the next 4 spaces. *CH 3. In the first of the chain 3’s, work 5 double crochets together. (DC5TOG) (See above for written instruction.) Slip stitch into the next stitch and the next 3. Repeat from * around the entire blanket. Dots: with your safety pins, mark the area where you would like to sew on your dots. Cut a piece of pipsqueak yarn approximately the width of the blanket. (If you are doing a larger size than the size given here, cut about 28 inches of pipsqueak.) Thread through the needle, insert needle and bring it back up the width of three stitches, or your preference. Leave a 3 inch tail. Weave the needle in and out making a circle shape then start filling in the circle. Check the back of the work and fill in any spaces as you go. There is no wrong way to do this, just work your needle up and down to fill in and cover the white yarn, you want the dots to look the same on both sides. When you have a small amount left, finish on the same side of the blanket that the first tail is on and tie the two ends together in a tight knot. Cut the ends as short as you can to disguise them. Feel free to make the dots as big or as little as you wish! This picture is showing you the pink dots. I took this border out and spread the clusters further apart after taking this picture. I told Hannah after I finished this blanket it reminded me of a frosted cake with little beads around the edge. It really is a stunning blanket in real life. 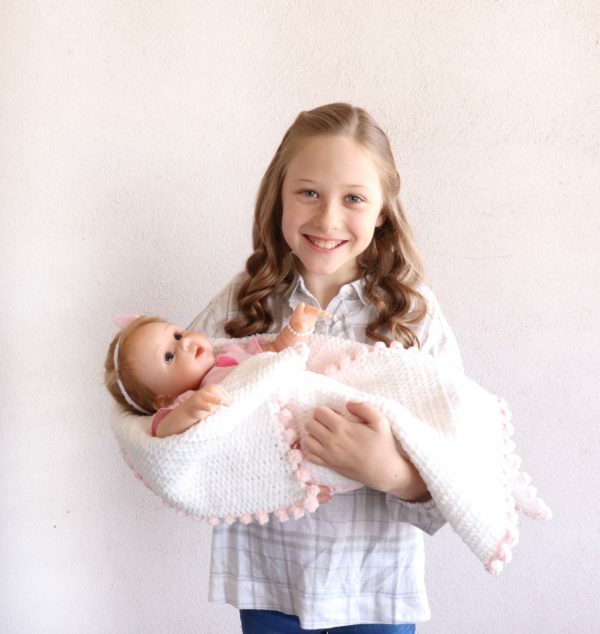 I hope you’ll give Bernat Baby Blanket Yarn a try with the Pipsqueak. Isn’t she so cute? This yarn is perfect for doll blankets too! Thank you for stopping by! We sure are having fun sharing what we are making as we prepare for hopeful grandma-hood for me and mom-hood for her! As Daisy Farm Crafts has grown, we try our hardest to answer email, but we simply cannot respond to all of you. Please check out our Instagram @daisyfarmcrafts where every day we are sharing what we are making and giving tips and instructions. We also have a @daisyfarm.stitches page where you could practice making swatches with the stitches we use for our blankets. We try and write our instructions as beginner friendly as possible. I’m so glad you love to crochet as much as us!